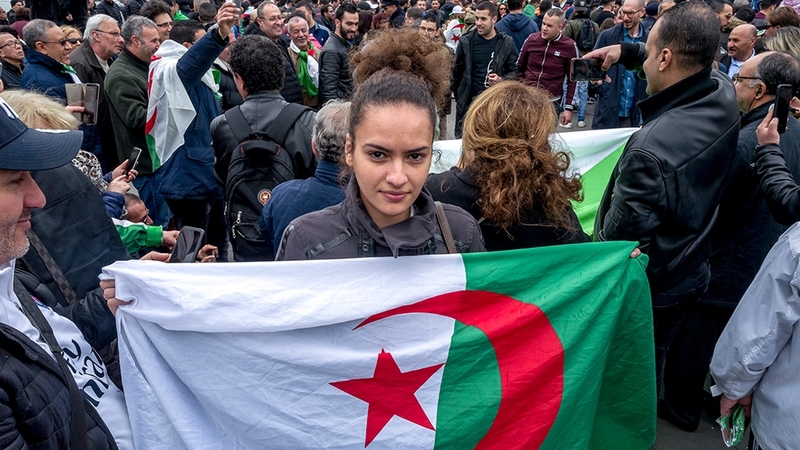 Paris, France – For a few hours on Sunday, the Place de la Republique was a sea of Algerian and indigenous Amazigh flags. 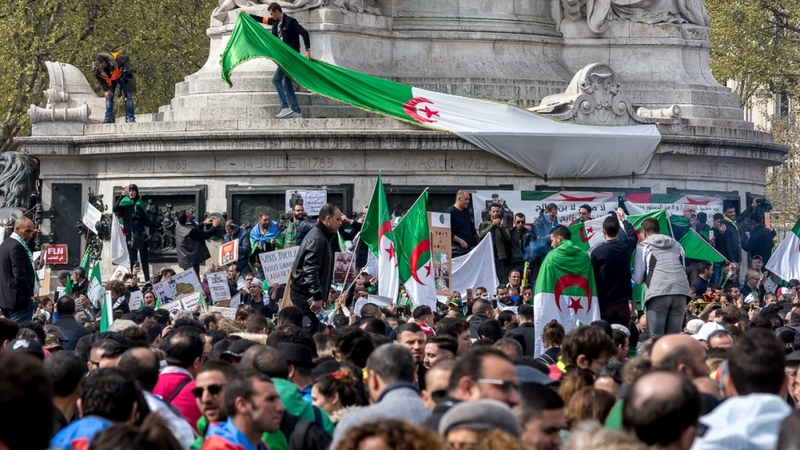 Thousands of protesters gathered here for the seventh consecutive week, this time demanding the departure of key allies of former President Abdelaziz Bouteflika, who quit in early April after weeks of massive popular demonstrations across Algeria. “We first gathered here as a sign of support for our fellow compatriots back home,” said Amira Hodeidi, one of the Paris protest organisers. “Now it’s different. We want the system to go away, and the movement and its ideology is beginning to structure itself day by day. Claims are clearer. For example, we want equality between men and women and basic social claims,” said the 26-year-old, who left Algeria two years ago. Hodeidi said she protested against Bouteflika in Algeria in 2014 when he won elections for the fourth time. Many of her friends were arrested, leading her to believe that she had no future in Algeria. Yet for Hodeidi, the euphoria of Bouteflika’s resignation was dimmed by the fact that his inner circle, collectively known as “the pouvoir”, remained in place. “The army, and mostly its chief Gaïd Salah, is trying to steal the movement away from us,” she said. “But people still showed up because they’re not stupid. We don’t want the military force to be the hero of this revolution. “The only hero here is the people,” she added, repeating a popular chant. 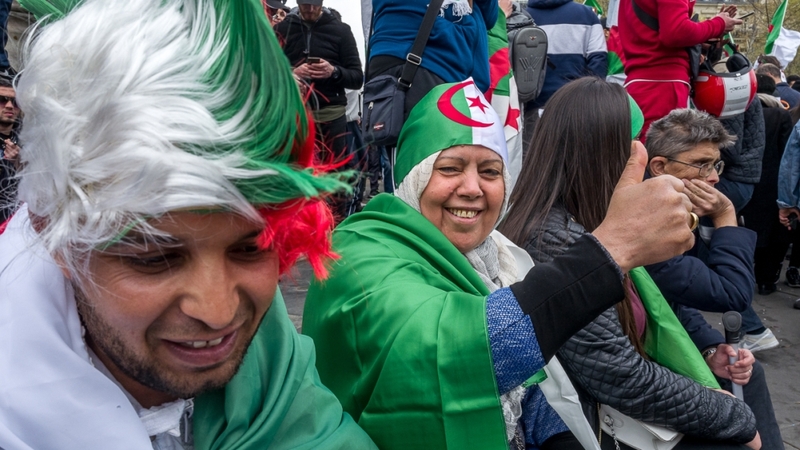 Protesters in Paris celebrated in the square with that message, singing the popular Algerian football song that became the anthem of the demonstrations, La Casa del Mouradiya, while carrying signs that read “Degagez tous” (remove all of them). Nadjib Hadjb, who lives in Paris and visits Algeria frequently, said people are demonstrating for the right to live, not just survive. “This system has to go away, and we’ll fight for this until our last breath,” he told Al Jazeera. His mother Fatima, who last visited Algeria in January, beamed widely. The magnitude of what comes next for Algeria is not lost on Sofia Djama, an Algerian filmmaker. Djama admits the technicalities of the transition remain unclear, but ultimately the objective is to build a new system without enabling the former president’s formidable decision-makers, known as “the pouvoir” to maintain their grip on power. There is already an air of optimism regarding the near future, according to Hodeidi. Protest organisers held citizen debates in the square, attended by people from a range of socioeconomic backgrounds, that she said was both uplifting and constructive. “By simply talking and saying what we want, it was like we discovered ourselves through the finding of common causes,” she said. For protesters and observers alike, there is little trepidation regarding a counter-revolutionary process, such as those witnessed in other Arab states in the aftermath of the 2011 uprisings.